The Eastern Alps of Austria must be one of the most picturesque places in the world, from the snow-covered alpine region, to the 200 crystal clear lakes and the many castles, museums and breweries to visit there is not shortage of things to do. Everywhere you go the food is as spectacular as the scenery and not only does the beer flow but there is an abundance of wineries and literally a “Cider Trail”. 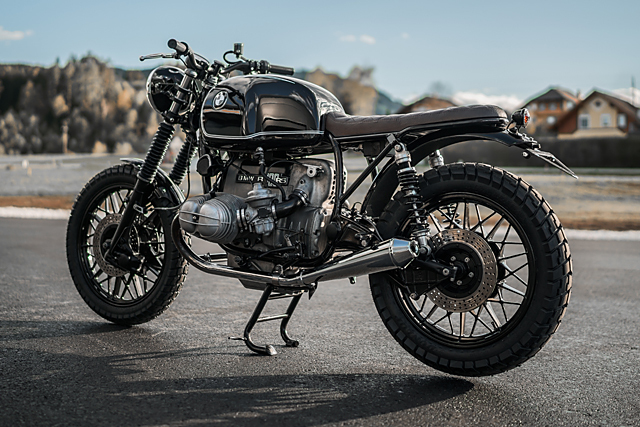 The only thing left to decide is how to get around the perfectly laid mountain roads and it’s hard to think of anything that suits more than two wheels. 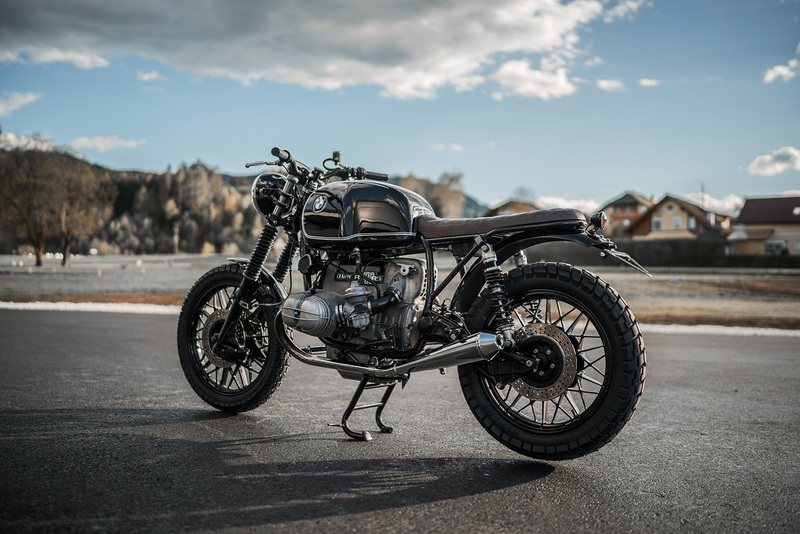 It’s here that David Widmann and his team Kurt and Manuel operate National Custom Tech (NCT) and turn out the perfect machines for sweeping through the mountain passes or munching up the flower covered meadows. 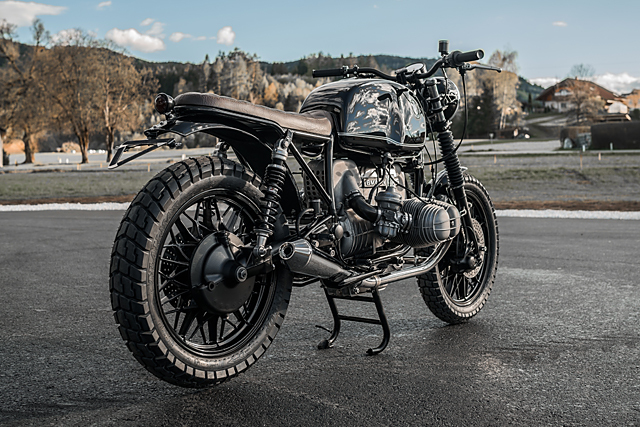 Although the young guns have built everything from a Ducati Streetfighter to a side-car equipped Moto Guzzi, their passion and pride is in slick old school BMW’s. 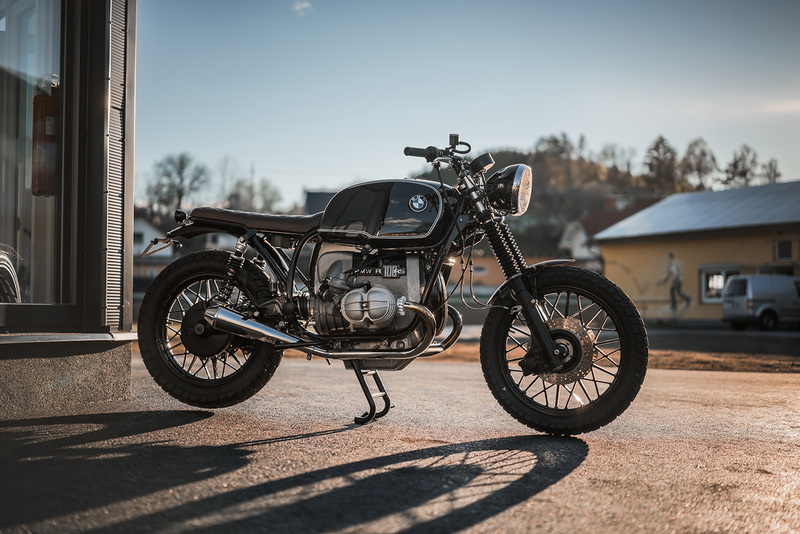 Having built a large variety of customs from the Bavarian R series range they decided it was time to get back to basics, a no-nonsense Scrambler that did everything as it should but didn’t make a fuss about it. 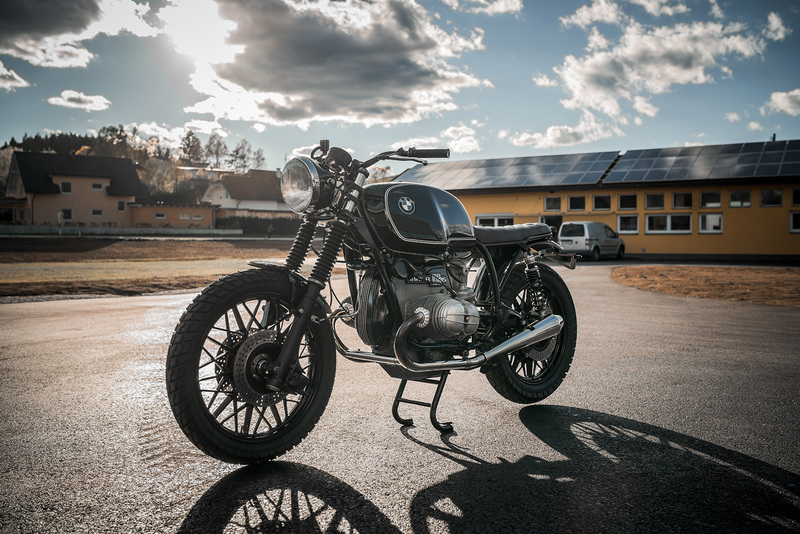 Known as “The Crow” for its sleek black lines and minimalist approach it’s come a long way from the 1977 BMW R100RS it started life as. The RS was the prestige sports tourer of its day, full fairing, comfortable riding position and engineered with Rolls Royce-like precision to ensure it never let you down. Despite using older, but proven, technology and being priced beyond its competition it was a great seller for the German and for these reasons it’s still around today. But to make a Scrambler the NCT crew had a lot of weight to strip off the big R before they could get started. With a wet weight of 230kg, even with the bulky fairings and touring accessories removed, they felt there was more to be shed. So the angle grinder was fired up and the long rear factory subframe was cut off and designs for a new item drawn up. 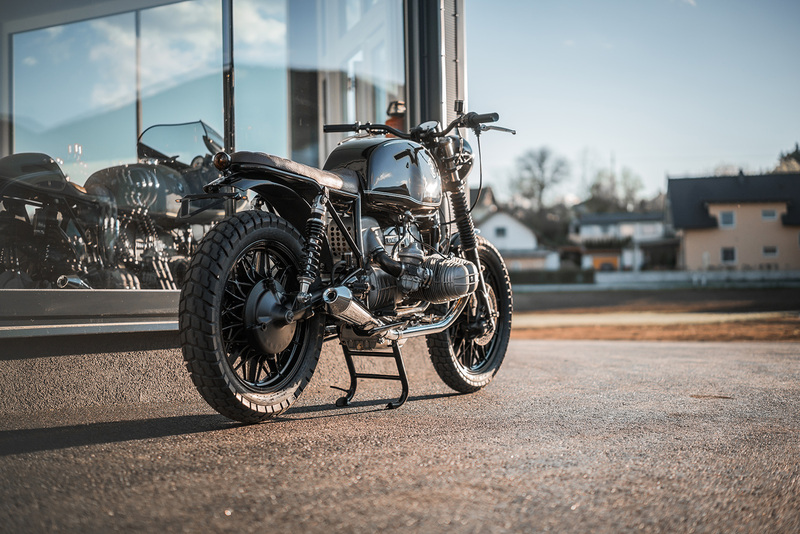 This was the first time NCT had built an entirely new rear frame, but the end result is perfect for the type of bike they wanted to create. The shortened unit has a hooped tail-piece that still allows for two-up riding but with a much cleaner look, while the re-positioned shock mounts allow for shorter more sporty shocks to better deal with the reduce weight and desired riding style. With the new round bar rear welded to the mainframe the rest of the chassis was de-tabbed and smoothed out to match perfectly with the new metal work. Bead blasting took care of any imperfections in the steel and the whole lot was coated in gloss black powder coat. With the foundations laid the bodywork could be planned and any true Scrambler needs a decent rear guard to stop the mud flying up the riders back. NCT fabricated a piece that goes all the way under the seat to the frame and just far enough back to be functional while still looking visually appealing. The front guard got a little extra chop but still keeps the worst of debris at bay before both were painted in frame matching black. With such a minimalist look and the unique shape of the tank the guys decided to make it the centrepiece of the build, but this meant body-working it until it was arrow straight as the paint to be applied would show up any imperfections. 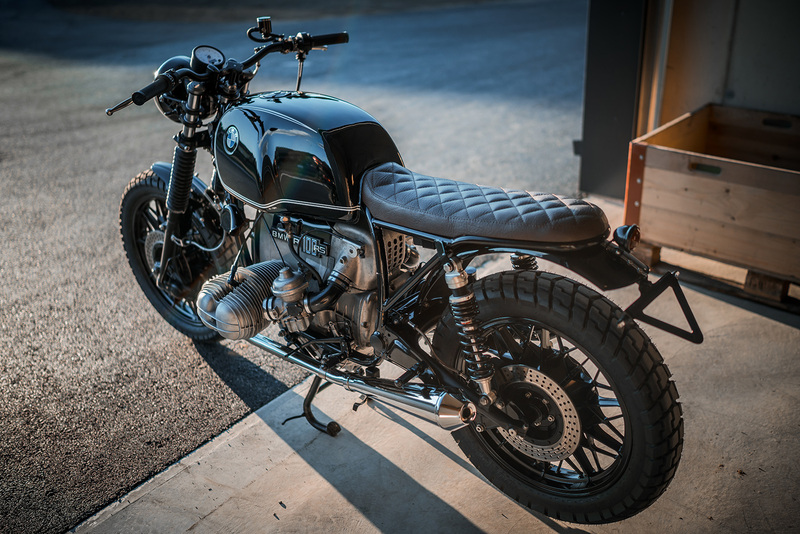 Laid on extremely think the black paint has a deep finish reminiscent of much older BMW’s with their acrylic finish and the white pin-stripping is straight out of the same era for a classic look. 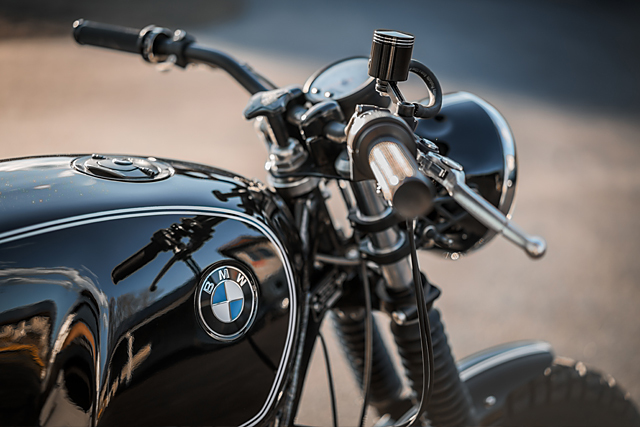 Setting off the abundance of black is the stunning dark brown leather seat, it’s another heritage touch with diamond stitching, plenty of cushioning and shaped to perfectly match the contours of the tank and frame. 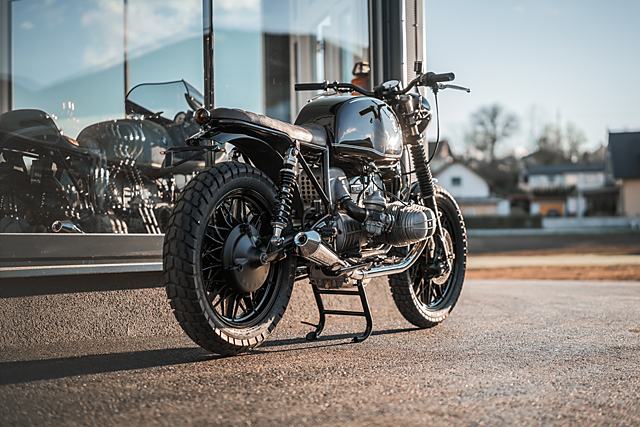 Despite being considerably smaller than standard it still retains the ability to carry a passenger and the pillion pegs have been replaced along with the riders with new sportier items. To give the hand controls the same feel a new set of tracker bars and sports grips from LSL give the confidence to fling the BM from side to side, with the levers rider adjustable. 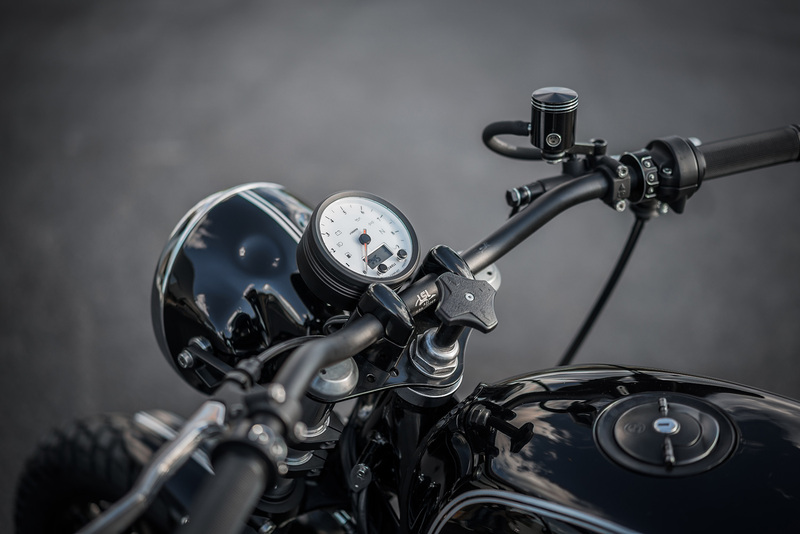 The entire bike was then painstakingly rewired with Motogadget’s m-Unit taking control and powering a full suite of Motogadget switches to control the new lights and a single Acewell speedo to monitor the vital signs. 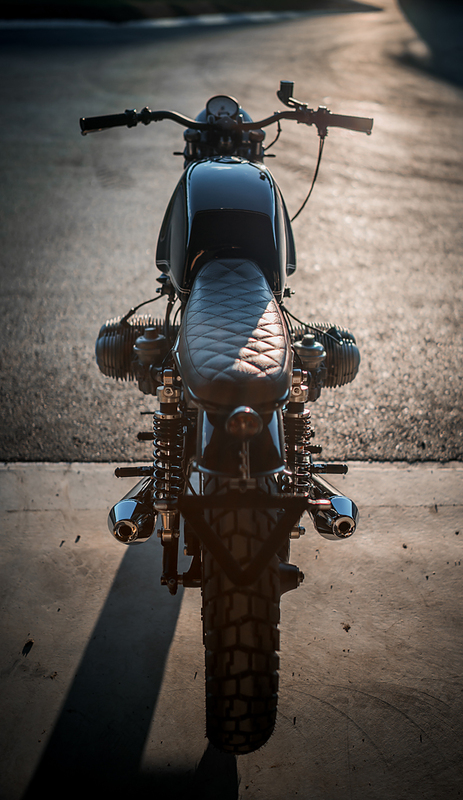 For David keeping the original look of the classic Boxer twin engine was crucial in a build that is focussed on functionality. But at nearly 40 years old the engine could look the same but it needed a complete overhaul to ensure another four decades of trouble-free motoring. 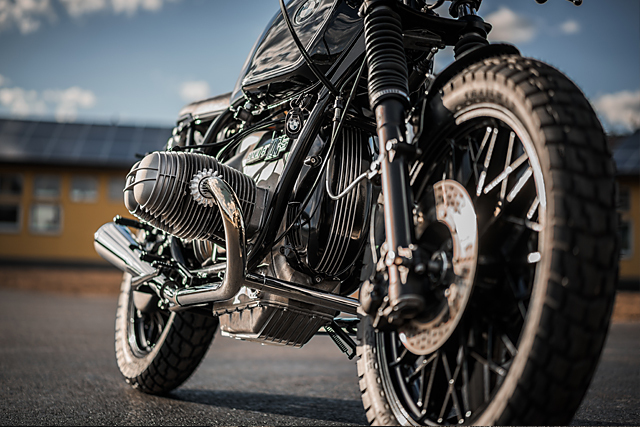 The 980cc air-cooled lump has a new set of gaskets to keep everything well sealed and the stock Bing carbs have been rebuilt while still drawing air through the standard box rather than pod filters. Like the rest of the bike the engines wiring was entirely replaced, including all the ignition system that can prove problematic in older machines and a lightweight battery placed under the seat. 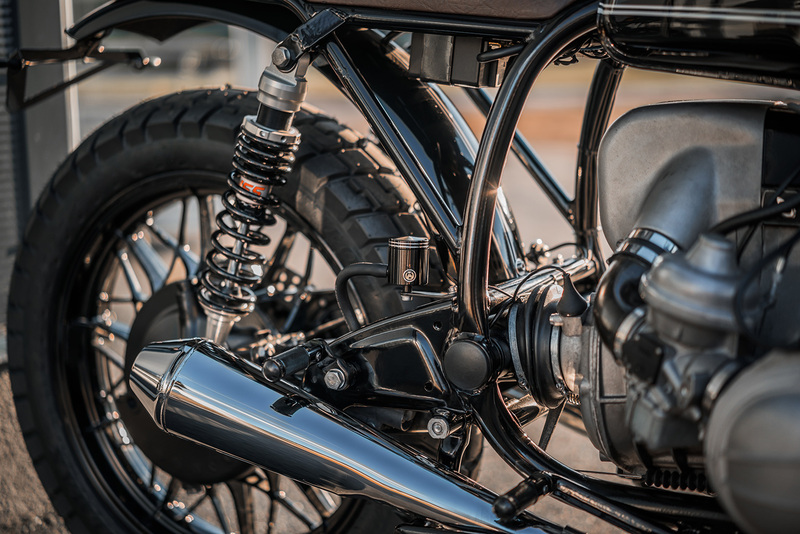 Having built a wide range of exhausts for Boxer twins, including complex and lightweight 2 into 1 systems, David decided for The Crow the look would remain largely standard. New factory like 2 into 2 header pipes have been chrome plated and finish out in classic twin cans to best match the new length of the bike. To finish out the Scrambler build the suspension had to be brought up to scratch to be able to handle both on and off-road duties and the standard front has been rebuilt and painted in matte black. Gators keep the stanchions clean while a new master cylinder and braided brake lines give a nice feel to the standard twin rotor brakes. Out back is where the big dollars were spent and the new mounts hold a pair of fully adjustable YSS shocks that allow fine tuning in every parameter. 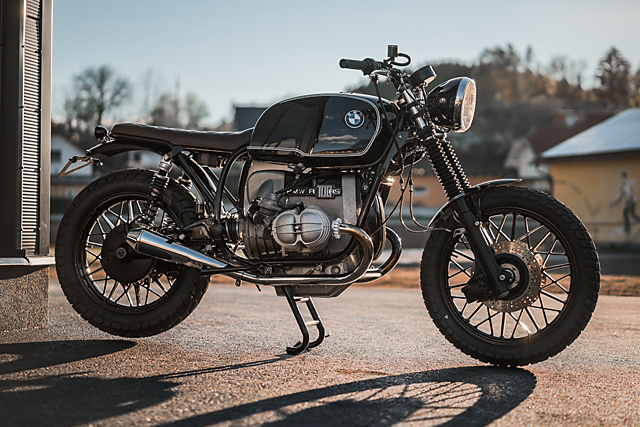 Which on a bike built for being ridden hard on and off the road it’s a damn good thing to never have to compromise. 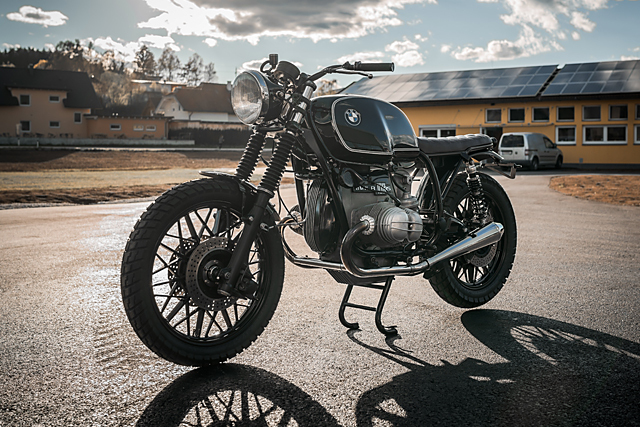 But with the fit and finish just as good as the ride the NCT Scrambler is also going to look just right parked out the front of one of those many Austrian breweries. 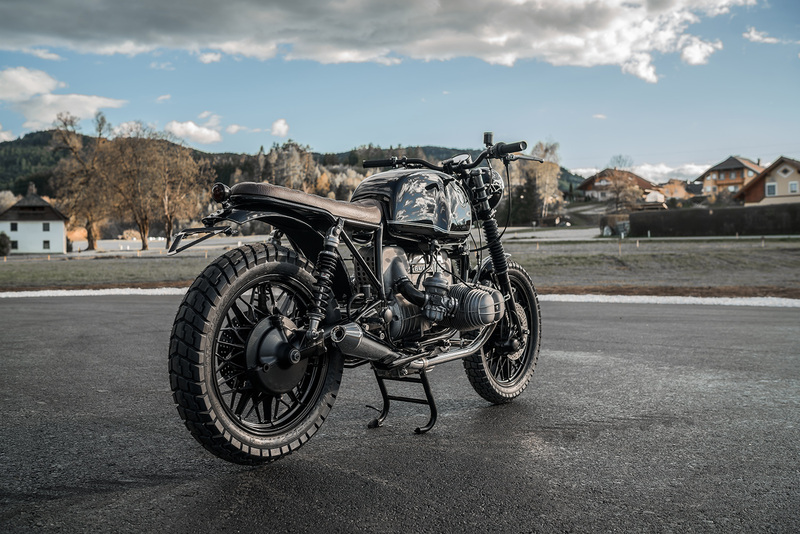 David and his team might have only begun in 2015 but with this build being number 18 already it seems clear the recipe for great bikes is Beer, Wine and Cider and plenty of fresh Austrian Alpine air!